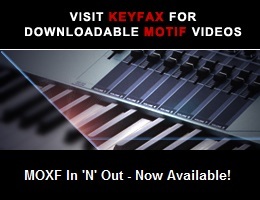 Viewing topic "How to get new bank of sounds into the motif xs"
Just downloaded the .xoa file. How do I copy the sounds into the motif xs? Did a search first but nothing informational. Well, read the manual. And then be more specific about what you don’t understand. MarcelB is right. If you read the manual then you would not have to asked the question. But Here is the quicktip for you. To load the samples from XSpanyourWolrd. Press FILE, Be sure the type = ALL. If you have the USB inserted into your XS and the XOA file is in there, all you need is to select the file and press LOAD. It takes a while for it to copied to the XS. REMEMBER TO BACKUP ALL YOUR DATA BEFORE LOADING THE SAMPLE. I see 2 under the Replies column but can’t see anything under my original post. What’s up? I do not understand. Did you see my post. There is a bug in the new site which means you cannot see replies to your own posts - great eh? :))_ a real improvement and worth all the months of waiting. Just sign out and go to the same thread and you will see the responses. If you then wish to respond, just sign in and respond to your own original post and it will go to the right place in thread. I know how to load these files and I assume they can’t be saved to the internal memory of the XS and will always have to be loaded at start-up with a USB device? Or is there a way to store a sample that I like so it be stored in a user bank? I have 1Gig of memory in the XS and is that something that will be used up if I have multiple samples auto loading at start up to use in my songs or is the memory only used when I’m sampling sounds on the XS? I’m not an expert here, but I beleive the answer to your question is Yes. Without RAM you can’t load any samples into the XS as there’s no built in RAM. Samples must be reloaded from the USB each time the unit is turned on. I have 2Gigs of memory and when I get new samples I load them all into the XS then save the all file as an XOA onto the USB. I then make sure this file is auto loaded into the XS when turned on which you can setup from Utility. Samples are stored in dynamic RAM which means they disappear when the power is turned off. However the autoload feature let’s you automatically re-load a file on power up, it is just the amount of time it takes to reload the data. The sample RAM is shared between sampled instruments and whatever tracks you sample yourself into your song. However 1 GB is a lot of memory to work with. I think jpondhawk question is more to the Voices and Performancesthat he downloaded form the XOA then loaded to the XS. IS IT GONE FROM THE INTERNAL? I would say no, cause I see them in there and I can play back the NewVoices and NewPerformance. ( There is 1 voice in the piano did not play unless I loaded form the USB , the name is S700 for XS). If jpondhawk is about the SAMPLING. then YAMAHA_US and searlStudio are right based on manual (I read it and done that). Correct me if the Xpand pack 1 to my knowledge is incorrect. I’m thinking the 2GB is a typo. The XS can only address 1GB of RAM.